I used to eat less than 1,200 calories a day as I pursued for a “better” me. Not anymore. See the shirtless guy below (left)? That’s me at my heaviest. When I was in secondary school, I was a solid mass weighing a whopping 112.8kg. By the time I enrolled in polytechnic 3 years ago, I was still overweight at 94kg. But one semester later, my weight plunged. See the muscle man above (right) with the toothy grin? That’s me at 70kg. At my lightest, I weighed just 66kg. Many people were wide-eyed with astonishment when they saw my transformation. “How did you do it?” They asked. Yes, I was proud of what I accomplished – but I always hesitated about answering their question. The truth is, my method for weight loss was extremely unhealthy. During the semester break, my diet consisted of less than 1,200 calories a day. I also exercised twice daily without any rest days. That included running 3km every morning, and swimming 10 laps every evening. During that period, I suffered from internal bleeding. 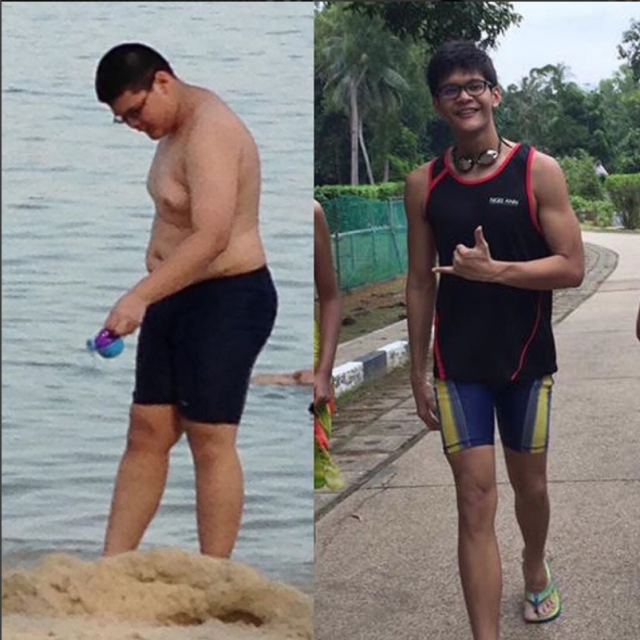 While I told everyone “I lost weight for health”, “I did it for National Service”, the truth is I did it to look better – to look just like all the good-looking people around me. But no matter how much weight I lost, my self-confidence still wavered. In fact, I became even more self-conscious about my weight. I weighed myself every day, and whenever the scale hit 70kg, I reverted to my extreme diet and exercise regime. “Am I popular now, like the rest of them?” I asked myself every time I looked into the mirror. I “achieved” my weight loss goal, but I was unsatisfied because I still kept comparing how I looked to the “better-looking guys”. College mental health experts attribute much of modern young adults’ unhappiness to unhealthy social comparisons. I started reflecting on my own behavior around 6 months ago, and I had to agree with former American statesman Theodore Roosevelt that “comparison is the thief of joy”. So I’ve since corrected my diet, eating around 2,400 calories a day. I also exercise once a week. In half a year, my weight went up from 66kg to 78kg. My body mass index (BMI) is at its healthiest now. But along with it, I’ve also regained my health and self-confidence.